Looking forward to the St. Nicholas Parade in Plaffeien on Sunday December, 2nd 2018. 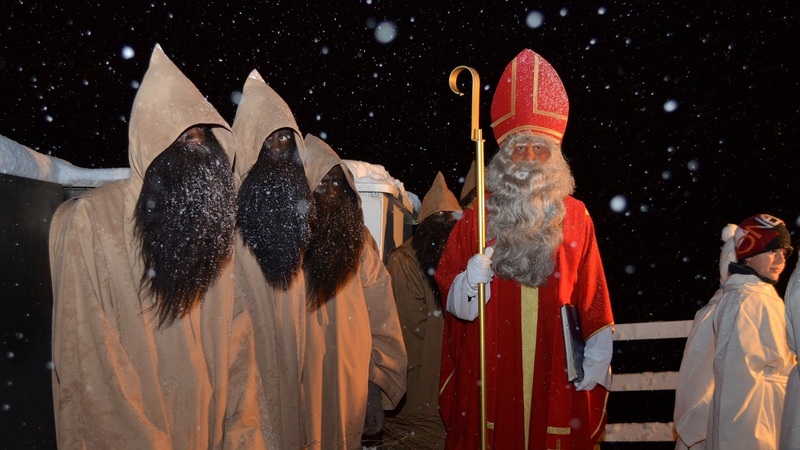 This year the traditional parade of St. Nicholas will take place on Sunday December, 2nd 2018. The parade starts at 5 p.m. During his visit he will be accompanied by Joseph and Maria, angels, shepherds with animals, dwarves, “Schmutzli“, “Gysler“, torchbearers and “Trychelers“. Various stands with mulled wine, marroni and other delicacies will fill the waiting time for St. Nicholas with anticipation. The highlight is the speech by St. Nicholas from the balcony of the Restaurant Hirschen, which refelts the happenings of the past year. The official end of the parade will be the children, who are allowed to recite the phrases to St. Nicholas.